At some point in life, it occurs to you that personal preferences aside, you're not really immortal. People close to you die. You might have a close call or two yourself. Sometimes you catch yourself thinking about dying, even on a sunny, beautiful day when, for you, death seems far, far away. On a couple of occasions, I've even given voice to this feeling out loud. Getting ready for a long bike ride in chancy weather that made me nervous, I remember saying to a couple other riders, "If something happens to me out there and I don't make it back, I'll have gone out doing something I love." I'm thinking about that because a Berkeley friend sent me a note yesterday about a widely known and loved Northern California cyclist died of an apparent heart attack last weekend during a ride up the northern slopes of Mount Hamilton.The rider was Tom Milton, and he happened to be just my age, 56; I did not happen to know him. He was in the middle of a 200-mile event called the Devil Mountain Double, one of the toughest rides in these parts. It's obvious from accounts of riders who saw him on his bike that day or during any one of his previous rides, that he loved cycling. I know the road he was riding. It combines the pain of a long, steep grind with exhilarating views over the ridges, canyons and valleys of a lonely backland. Condors would look at home there, and slow as the climb can be, the road gains altitude so quickly you have a sense of soaring. You can read about Tom here--an eyewitness account--or here--a series of tributes from fellow long-distance riders. Is there a take-away? We'll all have our own. Mine might be to embrace a little more readily the large and small joys that life affords us without worrying so much about what's not perfect in a situation. I also agree with one of the commenters at those links, though, who suggests we all ought to know CPR. The Grizzly Peak Cyclists, a local club here in Berkeley, has a slogan: "Eat to Ride, Ride to Eat." You've got both sides of the cyclist's eating equation right there: you need to fuel up to do this calorie-burning exercise, and this calorie-burning exercise allows you to indulge in one of the major pleasures in life--good food. The GPC holds a century every May, a hilly tour of the East Bay, and it justly prides itself on offering the best spread of any cycling event anywhere. Lots of fresh fruit and roasted potatoes at every stop along with a wide assortment of home-made cookies and quick breads that would be really bad for you if you weren't out riding your bike. The lunch and end stop are renowned for having all of the above plus roast chicken and salads and more. But for cyclists, fueling up is often--nearly always?--a matter of bowing to the necessity for jamming calories down one's gullet, not enjoying the experience of eating. The two main reasons: Time and convenience. To cover distance, you have to eat fast or on the bike. To eat fast, you eat processed, packaged items. To climb off the bike, walk in a cafe or restaurant and actually order something to eat? What an indulgence. A good meal or a decent restaurant experience in the midst of a ride can be nourishing beyond one's simple nutritional requirements. It can give you a break when a ride has become a grind. It can give you a chance to meet some of those strangers we're always zipping past. And, if you're lucky, it might even give you a chance to eat real, identifiable, tasty food that will give you a boost when you're back on the bike. I know everyone's got their own list of favorites--tell me about them!--but here are a few of the rewarding food stops I've had along the road. Most are commercial ventures you can visit yourself; a couple are one-off food offerings that cannot be replicated unless you have some very, very good and dedicated foody friends. 1. Marshall Store/Marshall, California: Go for the chowder, stay for the Sierra Nevada. The Marshall Store is on Highway 1 in Marin County, on the eastern shore of Tomales Bay. It's also on the route of some of the brevets put on by the San Francisco Randonneurs. My very first 200-kilometer brevet with that club, in 2003, began as a rainy day and then turned blustery and cool. The route included a 10-mile leg north along Highway 1 from Point Reyes Station into what had built into a pretty healthy headwind that had whipped up whitecaps on the bay. I'll ever forget getting to the store, where we had been told they'd have extra chowder ready for us. I got a cup, some bread, and a ginger beer. Wow! Restorative! Also exhilarating: The knowledge that heading back south I had a tailwind waiting for me. I've stopped here many times since and on one wet ride even had a Sierra Nevada pale ale along with my chowder (across the table from me: one of the brewery's sales managers). 2. Pete's home-cooked soup/Calistoga, California: Again from '03. I did my first 600-kilometer brevet that year. That's 375 miles in the course of a weekend, and while I was in good enough shape, I was barely prepared for the lack of sleep or the misery of a night and morning of cold rain on a tough climb. Come to think of it, I had a series of bad and good food moments on that brevet. Early on, I went into a state where I found food very unpalatable, almost nauseating. As I failed to take any significant calories on board, I started to fade and struggled out to the turnaround point, situated in a sodden campground in the redwoods along Highway 128 west of Boonville. It was pouring rain out there, and I stood under a tarp and unenthusiastically ate a Cup o' Noodles. I got back on my bike wondering whether I really had another 190 miles in me. Then, a roadside apple cider stand appeared. I stopped and got some fresh apple juice, which somehow went down with no complaint. I had a second glass, and got on my bike. I made it to Boonville, where I passed a restaurant called Horn of Zees (that's "cup of coffee" in the local argot, called Boontling). Suddenly I was hungry. I parked my bike, took off all my wet stuff, went in and ordered eggs and toast and potatoes. It tasted great. I still had a big climb ahead, on Highway 253 between the Anderson Valley and Ukiah. But the food was working, and I managed to grind up the ascent, taking my time but not stopping. The weather was improving -- some showery rain on the descent. And by the time I got in and out of Ukiah, it was a sunny, warm May afternoon with a freshening northerly wind. I hit Calistoga, about 75 miles from the finish in Davis, just after dark. My friend Pete drove up from Napa to meet me. In addition to moral support, he brought some outrageously good split pea soup, some home-made bread, and a big cookie he had whipped up. I don't think anything has ever tasted better. As it happened, I had a long night ahead of me, but that food and the gift of bringing it to me on the roadside kept me pushing. 3. Cook's Station/Pioneer, California: Another memory of 2003. My friend Bruce and I took on an epic training tour of the northern Sierra as our final training for that year's Paris-Brest-Paris. We took the train up to Sacramento on the last Wednesday night in July, then hit the road at 6 a.m. Thursday morning bound for South Lake Tahoe--about 145 miles and 13,000 feet of climbing away. Bruce had a rack and bag mounted to a seatpost, I was carrying clothes, supplies, and water in a large Camelbak. We fueled up at a Denny's in Fair Oaks, then headed up HIghway 16 to Plymouth. I remember passing through Fiddletown and riding up something called Shake Ridge Road. Given the season, it was blazing hot. We emerged onto Highway 88, and started riding east and up. At about the 5,000 foot level, and I'm guessing maybe 80 miles or so into our ride, we saw a cafe: Cook's Station. All I remember is hamburgers and fries and Cokes with lots of ice, and friendly service and more ice to go into our water bottles and Camelbaks when we left the place. I have no idea how the food would taste if I pulled over on a car trip, but on this day, it was an oasis, and one still fondly remembered. 4. The Polka Dot/Quincy, California: On Day Two of our Sierra epic, Bruce and I rode up along the west side of Lake Tahoe, through Truckee, then up Highway 89 to Sierraville. Right at the crossroads there--89 meets 49 there--we ate at the Round Up Cafe. Perhaps we weren't in desperate-enough straits to love the place, but the memory is: decent food, very long wait. We rode north on 89 through Graeagle (ice-cream stop) and on to Quincy. For some reason, the heat really hit us there. Luckily, as we came into town we passed a drive-in, the Polka Dot, which advertised "Frosties." Don't know what Bruce had, but I had a big root-beer float. Like every root-beer float on a hot day, it was the best one ever. What may have given this one the edge: the presence of a little picnic area next to the drive-in that had a small irrigation ditch with ice-cold water in it. Without a doubt the best float/foot-soak combo ever. Come to think of it, this day ended with another food experience: We wound up in a battered little motel in Greenville, cleaned up, then hopped on our bikes and the six or seven miles back to the hotel in Crescent Mills for a great dinner. Sadly, the hotel and the restaurant have shut down since our visit. 5. Veronica's house/Marin County, California: In 2007, I did a 24-hour event called a fleche (French for arrow) with a squad of like-minded long-distance cyclists (each group in the event is limited to five riders). The challenge in a fleche is to set a schedule that lets you comfortably cover the required minimum distance (360 kilometers, about 225 miles) without working too hard or not hard enough. It's a different mindset--this is a 200-mile ride! gotta take care of business!--than the one that takes hold when you have a long way to go. There's time to socialize, there's time to stop and eat, and there's an enforced halt that bars you from being closer to 25 miles to the end with two hours to go (why this requirement? Ask the French). On the '07 fleche, we started from Berkeley, rode up to Winters (which has two fine eateries for cyclists--the Putah Creek Cafe and Steady Eddy's Coffee), then headed over to the Napa Valley and from there into Sonoma County. We ate dinner in Healdsburg, then commenced our leisurely nightlong leg toward the Golden Gate Bridge. One of our teammates, Veronica, lived along the route, and we made her house our last stop). She had prepared some dishes and enlisted her two teenage kids to get everything ready for us when we arrived--I think she made a call home to them at about 4 in the morning to alert them of our arrival within the hour). I'll be honest--I don't remember what I ate, other than the fact it was breakfasty, hot, and good and with plenty of juice and coffee. But the experience, having the kids take care of a pack of strange, smelly, cyclists in the middle of the night, was one of the best I've ever had on a ride. 6. Motel cafe/St. Francis, Kansas: How good is the food in St. Francis? While doing a 1,000-kilometer brevet that ran from Boulder, Colorado, out to north-central Kansas and back, I rode for a while with the ride organizer, John Lee. As we neared St. Francis, on U.S. 36 just east of the Colorado line, he waxed enthusiastic about the culinary choices ahead: "They've got pizza," he enthused. So I imagined ... pizza. What he had in mind was the quick-stop market that included a row of molded plastic booths and display cases of pre-fab, foil-wrapped food items kept hot under infrared lamps. "Pizza" turned out to be one of those pre-fab items. I think I opted for "cheeseburger." Eventually I washed the taste away with a Bud imbibed in a cinder-block bar along the highway in an even smaller town, McDonald. The ride grew tougher after that. A strong southerly breeze was blowing by the time I hit the road at my overnight stop, Acton, Kansas. All day long, I fought a 25 mph crosswind. The first open cafe we came to, in Norton, was lousy. The turnaround town, Kensington, had a town market with a cafeteria-style lunch counter. It looked like great food, a bunch of townspeople were there for lunch, and the other riders all raved about it. But I was in one of my "can't-eat, don't want to eat" moments and rode on without lunch. Instead, I ate at a fly-blown McDonald's back in Norton. Bad news, and more to come in Oberlin, where I ate the gas-station quick mart (more Kansas "pizza"). The wind seemed to drop a bit on the final leg back to Atwood, where, with about 470 miles in my legs in 40 hours, all I wanted to do was sleep. The wind was blowing the next morning, too, where the first open cafe we'd find would be in St. Francis. I can tell you that it took about four hours to go fewer than 50 miles and that the stars out there on the Plains were incredible. St. Francis is nestled in a narrow valley created by the Republican River, and on first sight looks green and welcoming, an oasis. Up close, it's a little harder on the eyes, but rolling in after a long battle with the wind was a relief. John Lee had advised there were two cafes in town and recommended one--I honestly can't remember which now--maybe The Dusty Farmer. Another Bay Area rider and I stopped there. The food--just eggs, bacon, toast and coffee--was actually pretty tasty. I commented on that to the owner, and asked why the place was empty at 7:30 on a weekday. Well, he said, he was new in town, and had bought the cafe and an adjoining motel as an investment. He thought he had an inside track for local business--his son was the town football coach. But he was finding that even though he'd gone out and found a good cook, no one would give the place a chance. Most of his business was coming from crews drilling for oil nearby. It was a sad scene--the guy had egg on his shirt, as I remember, a couple days' growth of beard, and was missing his upper front teeth. Would I go back? Next time I'm riding through Kansas in a wind storm. 1. No more altercations with surly, clueless motorists. 2. Get to wear all those old, oversize jeans in your closet again. 3. Carry your spare tire with you everywhere, not just on the road. 4. No more inhaling nasty exhaust fumes--unless from the comfort of your own gas-guzzling car. 5. Fewer saddle sores and miscellaneous numbness issues. 7. Give strangers fewer reasons to ridicule the way you dress. 8. More couch time for aerobically challenging sports on TV. 9. More leisure to drink beer, set up empties in a "pace line." 10. More time for hobbies like talking about the good old days when you did ride. I've meant to note for the last couple of days that this is the week of the Gold Rush Randonee. My explanation of a randonee usually prompts a reaction combining puzzlement (why would someone do such a thing?) with horror (you mean people really do that without being forced?). Here's your basic randonee: 750 miles in 90 hours, with a series of checkpoints on the way to make sure you're moving along smartly and not taking shortcuts. So far, you're just quizzical: "Yes? Hmmm. That's a long way." You are correct. In ballpark numbers, 750 miles is a distance akin to San Francisco to Seattle. If you're very motivated, you can probably do that drive in 13 hours up Interstate 5. On a bike, you want to build up to the adventure. Nice 50-mile increments would be pleasant. Take a couple of weeks to enjoy the scenery. Or maybe you're a cycling animal and you do a 100 miles per diem, a century a day for eight days. Here's where curiosity encounters fear. "Ninety hours? How many days is that?" Three and three-quarters. So to do your 750 miles in that time means pedaling a cool double-century a day. Yes, people actually do it. I can bear witness. But I won't detour into some of the odder realities of the randonee--the night-time starts, the all-night rides, the naps in the ditches, the slow descent into an often less than coherent or rational frame of mind. I'd never think of mentioning the equipment fetishes. Still, you can't help but ask: "How do you sit on a bike seat after all those miles?" Yes, but not comfortably, and could lead me on a digression on all the ways people try to deal with seating discomfort, their theories about the hidden causes of their seat pain, and the sure-fire method of spotting someone who's ridden about 100 miles farther than their back end can tolerate. But no digressions from me. I just wanted to note the Gold Rush riders are out there, toiling from Davis, at the southwestern corner of the Sacramento Valley, across mountains and high desert to Davis Creek, just below the Oregon border on U.S. 395. They left Monday at 6 p.m., and the first rider of the 117 who started will be back in Davis in two hours or so -- only 54 or 55 hours on the road. I'd like to know how much that guy slept. I know several folks on the ride, and it's been fun to follow their progress in the Davis Bike Club's updates. My friend Bruce, who will turn 63 this August, seems to be several hours ahead of his pace four years ago. Amazing, really. It's like this: a trusted reader went over that bike piece and pointed out a few things about it. I was reluctant to acknowledge the reader's points, but eventually saw their merit. The new version of the piece has a lot in common with the first, but has jettisoned a lot of what I'll call random rhapsodizing. I liked the rhapsodizing. I just found it didn't work the way I thought it did. The rewrite: It's after the jump. I'm more than willing to concede that I might occasionally have a screw come loose. I always have an ear out for the telltale rattle. But what does that have to do with the picture above (click for larger images)? We'll get to that. 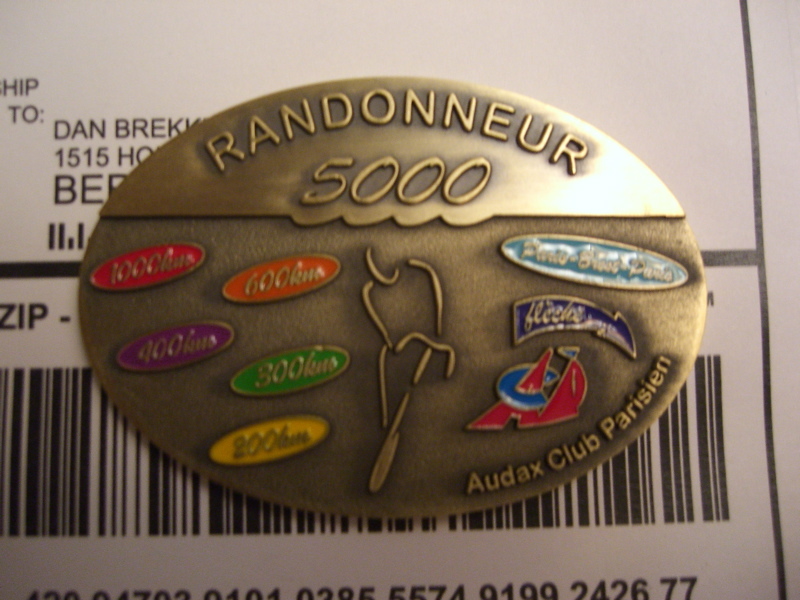 What is depicted there, in all its dimly lit, slightly blurred, slow-shutter-speed glory, is a Randonneur 5000 medal. 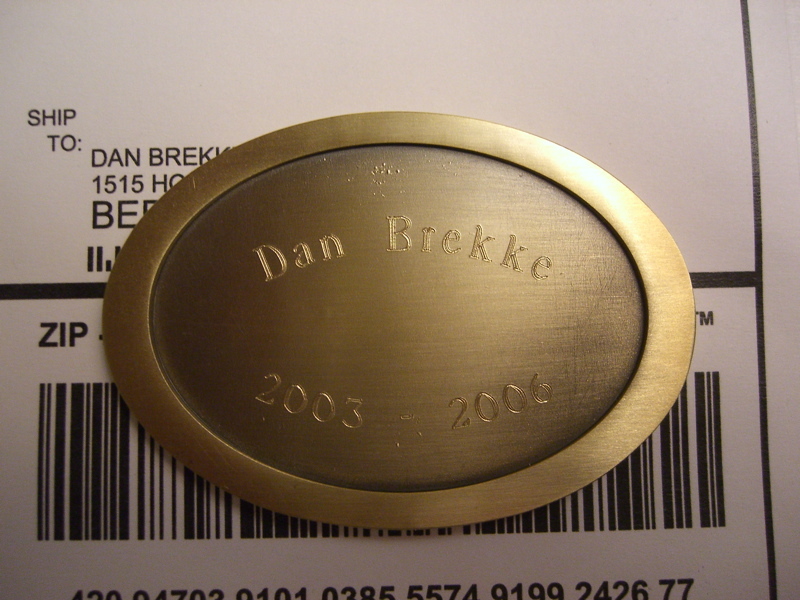 My name is engraved on it, meaning I earned it. What is it? It's the reward one gets for completing a series of long bike rides in randonneur mode. I see on the Western States Ride Calendar that there's a 200-kilometer (125-American Distance Unit) brevet in southern Utah on December 1. It's a great fantasy: driving out there across central Nevada, maybe doing a little riding along the way, then riding in that beautiful red rock landscape. But it's a long way to go for a bike ride, especially having driven up to Coeur d'Alene in October. And besides, I'd never get away with it. December 1 is my wedding anniversary.